For those of you who don’t follow me on Twitter, I’m posting this here. I’m pretty sure this copy machine is out of order. Nowhere in sight, as a matter of fact. 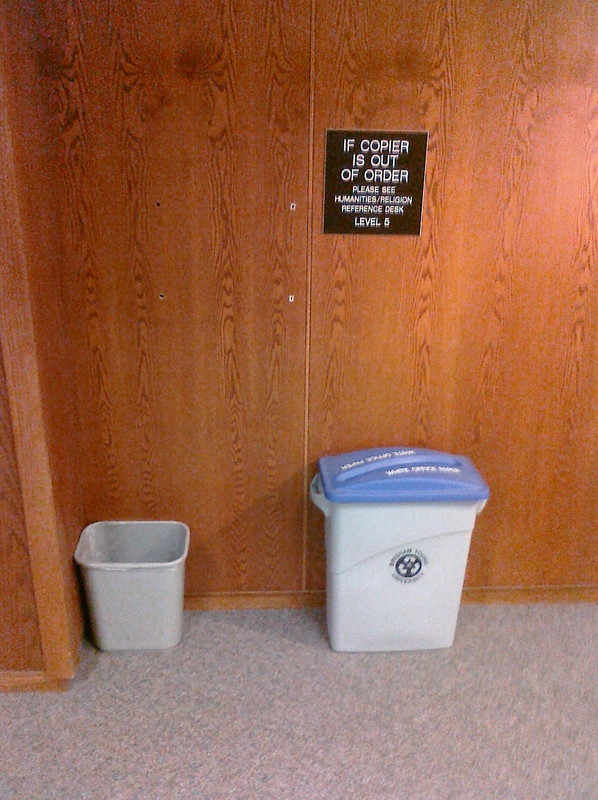 Unless that recycle bin is supposed to do it. Magically. How do I get to the Humanities reference desk? Anyone? Tonight I attended a concert of the Utah Premiere Brass, as part of the annual BYU OcTUBAfest. The concert featured several pieces arranged for tuba or euphonium solo with the accompaniment of the British-style brass band. The piece I enjoyed the most was titled “Gabriel’s Oboe,” a song written by Ennio Morricone for the film The Mission. The arrangement they performed featured Brenden McQuay on the tuba, playing a transcription of the oboe part. The song was beautifully arranged and featured well the lovely, full brass sound for which UPB is so well-known. Pien’ d’umanità in fondo l’anima.